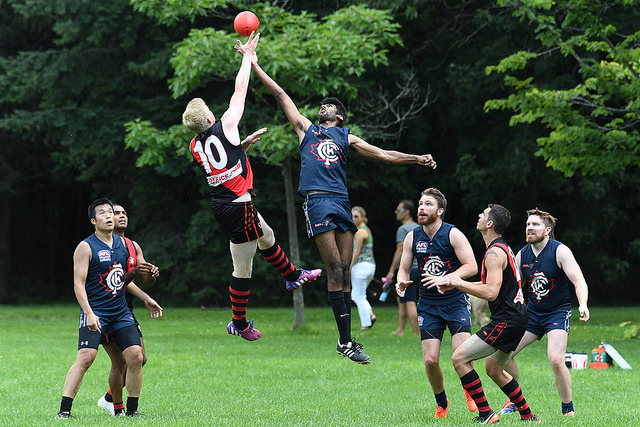 After another tough outing against the Swans the Toronto Dingos came into their match with the Central Blues knowing that they would need a good showing to maintain their place in the race to the finals. While the Dingos are on the up this year the Blues have had a tough start to the season, still looking for an elusive first win but blooding plenty of new players in the process with a view to future success. As it turned out on this particular occasion this meant the Blues were a few short. Rather than force a forfeit Dingos veterans Everett “El Chapo” Wells, Gary “Will you please do my back” Conlon, and Steve “Snip Snip” Gordon took the opportunity to try on some new threads. The Dingos received an immediate boost through the return of ruckman Tom Bell who was strong all day in the middle and well supported around the ground by Michael “Laddy McLadd-a-lot”Ladd and Greg Gilbert. As a result the Dingos got the scoring underway early in this one and never really looked back, keeping the scoreboard ticking over at an impressive rate throughout. Last year the Dingos had significant difficulty getting clean ball to their primary target up front in Rob McNaughton, but there were again no such issues today resulting in him taking home more sausage rolls than he could carry. In the end he was awarded Best on Ground for his trouble. We expect 12 more next week! The Blues while getting occasional run out of the backline had difficulty moving things up field except in rare glimpses. Noddy wasn't the only one in the mix though, with ten different Dingos landing majors including rookie James Sharman much to the delight of his teammates. Things got a bit silly towards the end of this one, with even fullback Tim Indian sneaking in for a few sausage rolls, with the Dingos in the end running out the victors 24-16-160 to 1-3-9. 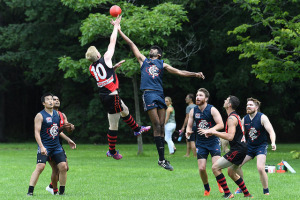 While this was a big win, the Dingos still had a few teaching moments in this one and will have to batten down the hatches as they head into their next clash against the Etobicoke Roos, who just lost their first match of the season against the Toronto Eagles and will be out to make amends. Following the game the teams took a few moments as Dingos president Everett Wells shared a few words about the impact former Blues player the late Jared Postance had on the club.